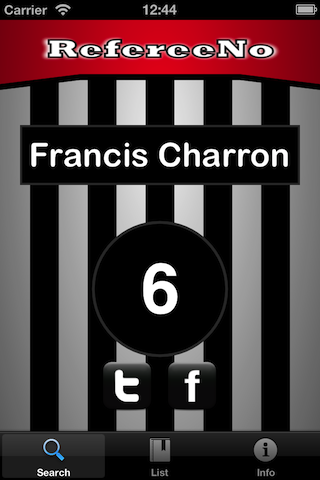 RefereeNo is an app to help you find the name of a Hockey referee by entering his jersey number. The app supports officials both from the National Hockey League and the Swedish Hockeyligan. Just input the number by clicking on the jersey and RefereeNo will instantly tell you who it belongs to. Maybe it's one of your favorites? Although we have high confidence in the data, we cannot guarantee 100 % accuracy. If you find something thats incorrect, please help us by reporting it by using the contact function inside the app. Screenshot showing the result of a search for NHL official no 6, Francis Charron. For more screenshots please click the AppStore link on the right hand side. RefereeNo is an app to help you find the name of a National Hockey League official (referee) by entering his jersey number. March 7:th, 2013: App extended with support for the National Hockey League, new version submitted. January 2:nd, 2013: First version now available on the AppStore! December 20:th, 2012: First version of app submitted for review! RefereeNo is developed in collaboration between Espling IT and LugAB. If you have any comments, suggestions, or problems, do not hesitate to contact us at domarnummer@mackaroni.se.